Finally, after years of hard work, THE LIFE AND ART OF WESLEY MORSE has gone to press! We're all proud of the end result. I hope the book satisfies your curiosity about the man and gives you a few surprises. The LIFE AND ART OF WESLEY MORSE, which has been in the works for several years, is nearing completion. We're really excited about. While it contains images that may be familiar to some of you, it also has never-before-seen illustrations that will surprise you. While I have not shared all aspects of my father's life in the book - some memories must remain for me alone - I have provided enough information to give readers an intimate glimpse into his private life. Although it's difficult not to get a sense of the man through his artwork, people are always asking me what he was like. He loved and grieved his way through the decades. In short, he was like the rest of us, only he did it with style and elegance and a unique artistic talent. We're hoping for a fall release of the book. It will be available in print. It has not been decided whether a digital edition will follow in the future. I can't imagine looking at all those beautiful images on a Kindle or Nook, but we'll see. Abrams Books released BAZOOKA JOE AND HIS GANG 60TH ANNIVERSARY COLLECTION in mid-May. We're really pleased with the way the book turned out. It has some really great info in it about my dad and a few samples of his artwork through the decades. It's just the tip of the iceberg. There's so much more to his story and portfolio of work that hopefully will be included in a book about him that we're working on. Meanwhile, on June 11th we visited the New York City offices of Abrams and met with Charles Kochman. We were asked to sign limited edition bookplates for the San Diego Comic-Con. If you're in the San Diego area, stop by. Check out the book. It's really cool. 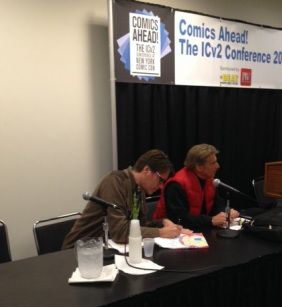 We were invited by Abrams ComicArts to take part in their panel at the New York Comic Con. What a blast. Below are some pictures.